Behold the bounty! This is what we harvested yesterday from the plot: two onions, dill, two kinds of lettuces (Red Salad Bowl and Butterhead Marvel), mizuna, garlic scapes, and peas. Glorious peas! I'd been looking forward to picking these peas all day. Michael and I thought they would be great in a salad of greens topped with salmon. Then I remembered the dill was ripe for picking too -- a perfect accompaniment for the fish. This is our best yield of peas ever. We had all of about six pods last year, and just one lonely pod in the first year (yes, really, just one) because I sowed them too late. Clearly I've become a better pea farmer now; I've grown enough to make an actual portion for two! 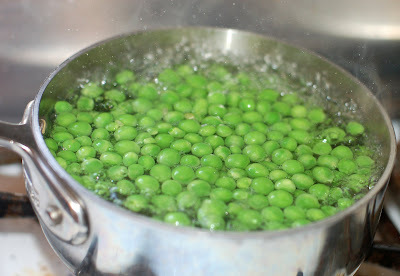 Beautiful green pearls... stripped from their perfectly aligned rows... blanched for a few moments in a boiling bath... then chilled in a bowl of ice water to preserve their sweet freshness. 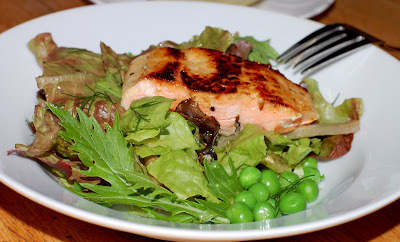 The peas were the jewels of our dill-accented dinner salad topped with honey-mustard glazed salmon. 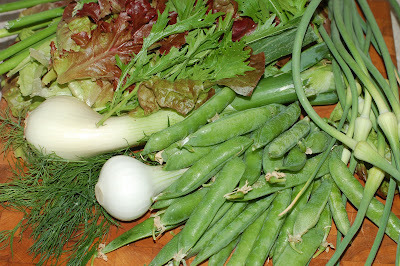 I've been so inspired by the goodness of peas; I plan to try growing another batch this fall. What beautiful food. I'm sure it tasted as good as it looked too. I didn't grow peas this year. I am in the process of designing a new veggie garden. I am only growing tomatoes and tomatillos. Maybe next year. Oh my goodness.What a wonderful harvest! When did you plant your peas?! I am so totally impressed by such an early pea harvest. My efforts have been pretty much an unmitigated disaster this year. Did you start them off under glass and plant out? Or is the DC climate more clement than the UK's?? What variety are your peas? I'm picking loads of mange tout at the moment - a variety called Reuzensuiker, its pods are held on tall stalks above the foliage and it has pretty green veined white flowers. It's a great year for peas in my garden. 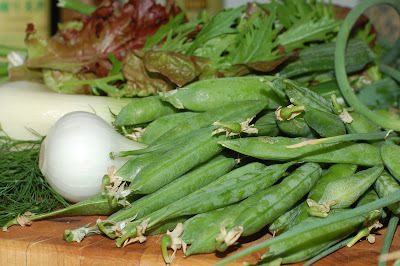 Last night we had chicken, mushroom and mange tout risotto - yummy!!!!! Thanks for squash plant update, was concerned about it! Also, PLEASE let us know when you plan to sow your peas for Fall (and how), so we can join in here in Annapolis, thanks, and everything looks just beautiful. I used a shell pea called Pioneer and planted the earliest ones on March 1. I put them directy in the ground (without any inoculant). Our summers get hot and humid very quickly here in DC, so I have to put them in early or they won't produce much of anything (as I learned in the past two years). These grew easily for me (after surviving an early attack by hungry birds that liked to eat the first leaves). I didn't give them any fertilizer; I just made sure to water them well -- especially when the pods were forming. This will be the first time I'll try a fall crop. I'll need to research the best time to sow the seeds. I'll keep you all posted. Thanks for visiting! The peas look amazing! I am impressed. They look beautiful! It is only morning, but you have made me hungry. I didn't even get time to plant peas this year and now you are making me wish I would have. Good job and good post. What a feast for the eyes...and the stomach! Doesn't food from your own garden always taste better? What a satisfying experience-growing and harvesting your own fresh produce, cooking and eating a lovely meal! Beautiful, exciting, fulfilling harvest. Salmon, peas, and dill--now that is a great combination! Your peas look fabulous! 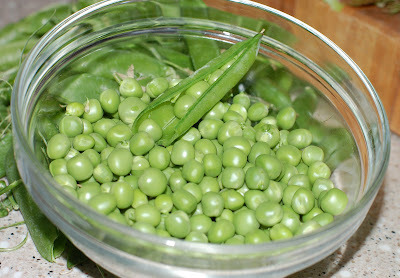 I'm also going to try some fall peas this year, since I had a good spring crop this year, too. I love peas and your dinner looks devine! I've never grown vegetables, only flowers and herbs, but you've tempted me! Those peas are just mouth watering! 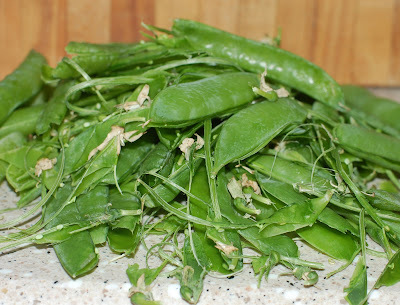 Peas just cannot taste the same when you buy them. Now you've got my stomach rumbling!